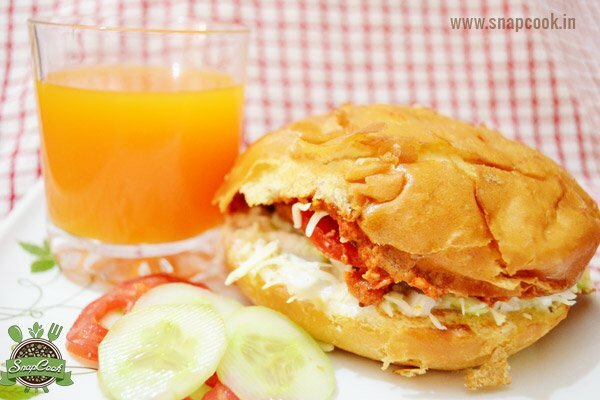 It is a tasty combination of chana tikki and buns, and it is healthy and of low calorie burger because of chana tikki. Mix all the ingredients of chana tikki together. Make round patties of this mixture and fry them on tawa with oil. Mix Malai and cabbage together and little salt in this and make a spread for burger. Now cut burgers into half, applybutter and griddle it on tawa till golden brown. On the burger, apply 1 tablespoon of Malai cabbage spread, put chana tikki on it and now topped with sliced onion, tomato and cucumber. Top with grated cheese with a sprinkle of chaat masala. Now put garlic chutney on the other part of bun and and put it on top. Serve hot with orange juice. Put salt on sliced onion, cucumber and tomato before placing in them in burger.